Do you think that you have the power to turn your dreams into reality? Do you believe that you can influence the flow of things and how people act without lifting a finger? Well, by reading Manifesting, you’ll learn that you’re more than capable of achieving and doing what others deem impossible. Manifesting is mainly about tapping into the power of your mind, having right vibrations, and never losing hope – all for the purpose of attaining what you seek. You’re probably thinking of one question right now – what kind of things could be manifested? The answer to that is simple, “everything.” Whether you wish to become successful in your chosen career or you aim to become wealthy enough to live comfortably, you’d be glad to know that doing such a mind-powered technique is among the best ways to finally materialize your desires. In fact, many have successfully attracted love through such an interesting approach. 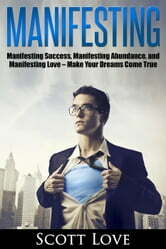 Grab a copy of Manifesting and change your life today!